Yep, that’s what she asks every time we order a kids meal at a fast food restaurant. She’s eight and has actually been asking this for a long time. Over the years, we have accumulated – like millions of household across America – tons of fast food toy crap. Little plastic things that really don’t do very much (except one truly awesome telescope that still works). 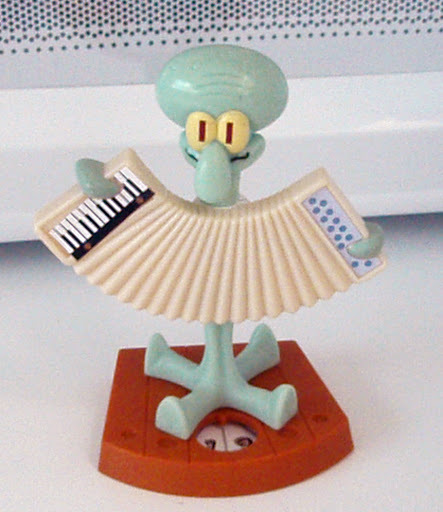 From Burger King: Squidward “High Low” toy. You actually need two of these to get the full stupid effect. 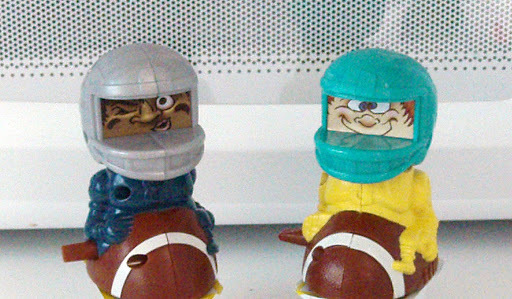 You manually move the numbers of both toys to see who got “high” and who got “low.” Really. 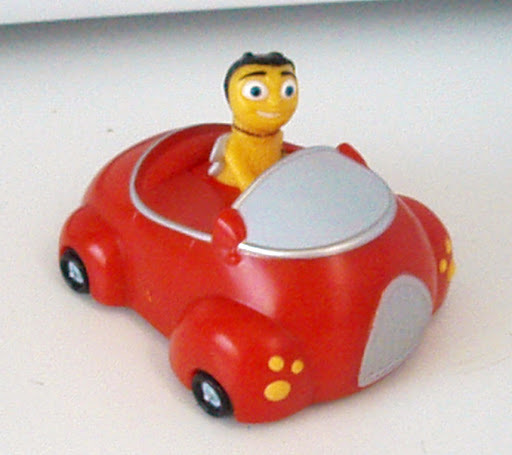 Carl’s Jr: Bee Movie car. “Mom, that’s for babies.” Except babies can’t have them. No one under three years old can have them. So why give them away at all? Since I am in marketing, I try to explain to her that toys have become something consumers expect in a kids meal and that they are often used to get children to demand a particular brand when choosing a fast food meal, “please mommy, we must go to McDonalds because they have Dunder Mifflin bobble heads!” sort of thing. Katie simply doesn’t buy it. She says she’d actually makes her eating decisions based on the food served (or, let’s face it, where I take her) and she does like getting a present with her meal, but she’d prefer something that didn’t hurt the earth. So she offered me a few ideas. I think she’s on to something and with that, I challenge the fast food industry to think twice about what they are doing and try an little innovation. iTunes: even at eight, she loves iTunes. Since a song is 99 cents, we realize one song per meal would be too much, but if three visits to the same place equaled one tune, collecting iTunes credits would be worth it – and would make her want to go back to the same place. Webkinz: she needs cash in Webkinz World. If she were to get a Webkinz collectible trading card (think about the exclusive potential here) it would give her added powers and points for her Webkinz account. With a decent partnership, it could get her access to new worlds or games. Earth-Friendly Collectibles: she cares about animals – a lot. She’d love to get trading cards with information about different animals that she could share with kids at school or interact with on the web. Maybe for every card code she enters, money goes to saving the rain forest. From frogs to polar bears to lady bugs, she wants to learn about these things and save them from extinction. Relationship Cards: she doesn’t really know what to call this but what she’s looking for is a way to get more information about the characters on shows she cares about (iCarly, Hannah Montana, etc.). Getting “inside scoop” is meaningful to her and gives her a social advantage with her friends. To keep it earth friendly, the “key” could again come on a card with an SMS text number or web code where a bevy of paperless information could be provided to her. Sometimes I am amazed at her ideas. I think they have merit, would be “green”, would meet the needs of most children and could be used to create interaction rather than landfill. All her ideas could last much longer than a stupid plastic toy and could actually create more of a relationship with her as a consumer not just with the fast food brand, but with the secondary brand (Hannah Montana, endangered animals, Webkinz, etc.) as well. Katie and I would love know how you feel about the toys in your kids meal. We also want your ideas for premiums that don’t involve plastic or pollute the earth. Ideas? Thoughts? Let us know! Tremendous insight – thanks. These toys are too often in service to the marketers/QSRs, and miss the point. We’d be better to listen to the kid, and then working the message/brand into that concept.That said, I would like a Dunder-Mifflin bobble head, please. I just watched the video. I have seen it before and forgot how darn funny it is! I miss the good old days of SNL. Thanks for the laugh. And yes, I believe Irwin may have moved on to promotional advertising!